Quote: "High tech circuitry is no replacement for guts." As collectors we all have early memories of being exposed to Transformers, and I am assuming if you are reading this review you got good ones like me. Well me playing in a box filled with them, and looking for different ones fill my early memories, included on that list is Ironhide. A bot who over the years has gone from being one of the first introduced to us as fans, to forgotten, to rookie, to killed in the movies twice (maybe he needs to skip them from now on) to being one of the Autobot's tough guys once again. Just in case anyone asks, nope the one who appears alongside this one isn't the same one as the one I had a kid. In both season 1 & 2 of the Generation 1 Ironhide was sure to pop up helping out. Usually by crushing Decepticons or playing some pivotal role to the story. He was the old tough guy that the Autobots had. The guy who didn't think who didn't talk, he did! He even fought off old age given how some people made noise he was due for a cushy office job. Yes he broke the rules sometimes by flying, or by not being at attention at his post, but he was also always there to help humans in danger, and given his all until the end, even when it cost him his life. In a sense here the Combiner Wars pick up from where the Generations line stops. It isn't connected to an active show, and if you are in the US you get a comic book with the toy. I think more than a few Canadian fans feel a bit slighted because we're shorted a goodie, wait longer, and pay more for the toy, but I digress. At least my comic gave me a Pre Mission psych-screening report by run, Autobot Psy-Ops Specialist. The report is as follows. If Cybertron had cowboys, Ironhide would have been a Sheriff. A beloved and respected hero, Ironhide has been at the front of the Autobot charge since the very beginning. Equal parts warrior, bodyguard, and drill sergeant, his indomitable will and legendary toughness continue to be an inspiration to the Autobot forces. His duel cannon is one of the most interesting Cybertronian weapons - capable of blasting super-cooled nitrogen and white-hot molten lead. The defining attribute of Ironhide is his trithyllium-plated armor, which makes him almost impervious to artillery fire and edged weapons. A steel will wrapped in impenetrable armor? Yup - that's why we call him Ironhide. Just for the record here the good doctor does clear him for the mission that lead to this psych-screening. It's nice to see how he mentions several things the Generations 1 Ironhide was known for. Now he does have a rather short history for a warrior of his many years. Yup, before you go there is more, from the box here, The most dependable Autobot warrior would sacrifice his own spark to defend the cause of freedom. With the Combiner Wars raging, it doesn't take much to convince Ironhide to enter the battle as part of Optimus Maximus. According to Ironhide's box he forms Optimus Maximus's left leg. There goes him being Prime's right hand man, a roll given to Sunstreaker of all bots. Hey folks, I don't write this stuff up from thin air, I just try to give you clear concise info as a reviewer. 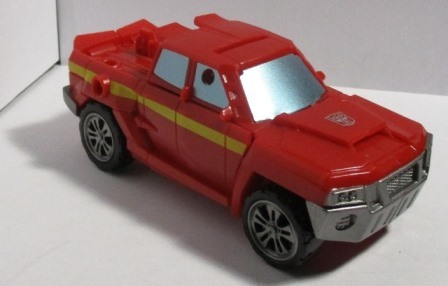 Before I go too far into this review, Ironhide is a repaint of the Decepticon Offroad. Reading both reviews might give you a fuller picture of this toy. Ironhide comes out of the box as a robot, and his trusty axe is nearby ready to help him chop up Decepticreeps. The axe has some nice detailing work, not the insane level that you need 22/20 vision to see it all. The axe edge is by the way as dull as possible, makes sense given how this is a toy. One of the nicer details on it, is the handle of this one handed axe looks like a tail pipe, perfect way to incorporate into his alternative mode, and to help it stick out less. Unlike the axe of Orion Pax. Let's look him up from the legs up. The knees bend to 90 degrees, so far so good. He doesn't have many exposed innards except for his upper thighs so we'll cut him some slack. There is a nice amount of detailing on his legs that pop. His legs can each rotate 360 degrees due to a connection in his upper thighs. His legs are held to his body by some solid ball joints, so far so good, I am happy. Now Ironhide can do a full 360 degree spin on his hips, imagine trying to that and not feeling so pain, well actually you wouldn't, but you'd also break your spin. OUCH! Hanging rather low on Ironhide's chest is his Autobot logo, common where is the pride that you're a good guy Ironhide? Couldn't it have been placed higher than his navel? Nice work on his chest, I dig the silver and silver/blue motive on each side. Can't say I like the black brick in the middle. Ah Ironhide's arms, well here is a dog's breakfast. Since if you fully extend the arm, it locks into one giant piece which is required for transformation, because of the two armor pieces on the armor. It makes it a bit hard to play with him position wise while doing this. It also gives him a full range of arm motion while doing so. The way I found to solve the armor problem is to extend the armour at his shoulders out at 90 degrees, gives him a more militaristic/G1 look I feel. Trade off is he loses his range of motion when he's like this. I'd feel bad if I didn't mention to you that the arms have enough range of motion that both hands can hold onto his 1 handed axe at the same time, and it give you a range from his head to his chest. Naturally one hand holding it has more range. As a whole in robot mode Ironhide is a great figure. We all know some figures just stand up straight and the balance is so bad that they'll tip over if they're not standing perfectly straight. While Ironhide, I've have him leaning over looking to chop off a head of a con, or axe pulled back looking ready to swing it like a real person would and he holds it perfectly! The only flaw I have to really report is his head tends to pop off rather easily, so go easy on it. 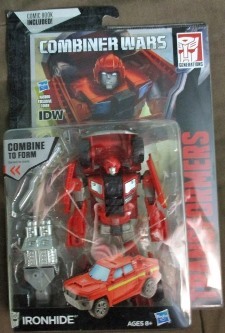 Now the box says Ironhide can be transformed in 10 easy steps, so let's see if that is true. The lower legs split open, the idea is to get the back of them to lock into the back of the cab as you moved them forward, leaving the front loose. This action will require you get them side by side so they fit in the correct space. We extend the arms fully, and both pieces click nicely into place. Push both shoulders down, don't worry there are pins there to make it easy to do this. Now lower the front of the truck into place, and smoothly clicks. As the final step swing the front legs forward to lock them into place. As far as can tell I did it in 6 steps, not 10. Maybe I see things differently than Hasbro. Let's give Ironhide a good look over in his alternative mode. 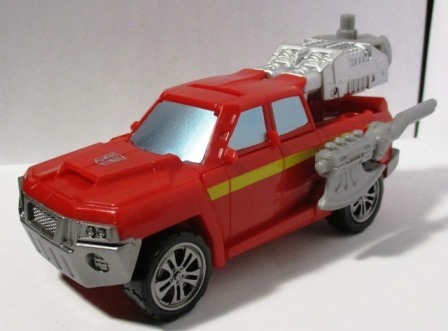 As a homage to his late movie counterpart he transforms into a truck. However, as a homage to the original one, he has nearly the same paint job. Now the wheels are clip-ons, there isn't anything holding them in place except 5 little pieces of plastic, and they can be popped on and off.Something I don't recommend you do. Because of how he transforms you have 4 5mm plugs in the back, so more than enough space to put the axe and any other weapons you might have on him there. There is a tab sticking out from the back of truck bed, perfect for a tow ability, but he has nothing to do tow at this point in time. The only two things that leave a sour taste in my mouth design wise is seeing his feet sticking down when I look at the end of the truck bed, and a screw where they passenger's side window is. Ironhide will roll smoothly across most surfaces, he's not a truck that is a brick, if someone wanted to play with him as a truck he'd be great. The only other flaw I feel the need to report with Ironhide is the fact that the extra engine block add-on that several sites show him with, doesn't work when he's being played with. Since he'd got nothing to hold that limb in place when it's in his truck bed. It's a bad idea. 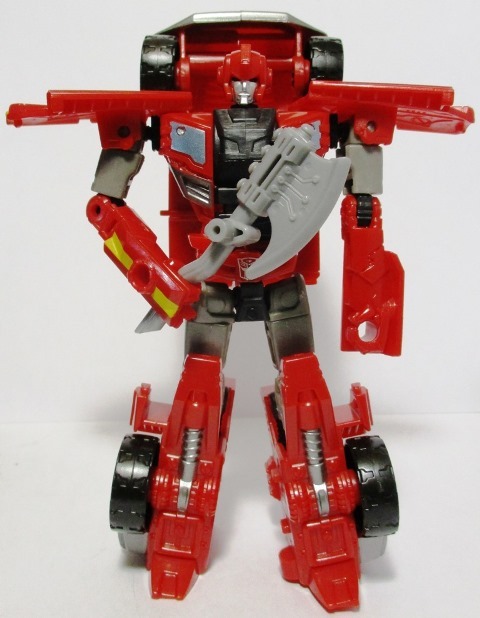 Transformation Design: 5/10 Ironhide is easy to transform, which is similar to the old Scrambler City era Transformers. I mean even months after last transforming him, I was able to get him from Truck, to Bot, to Limp without consulting the manual. He has a solid well thought out design, if only his head didn't pop off so easily. Maybe it's so when he blows a fuse, his head can pop off like many of us wish ours would? Durability: 9/10 Ironhide went through some of the toy durability tests, like being dropped from 4 feet onto a hard floor. Kicked around a room, and under a bed. He took them all in good stride. The only reason he's getting a 9 and not a perfect 10 is because his head is so easy to pop off. Fun:10/10 Ironhide does well as a truck, can handle holding positions besides just standing. Heck can throw that axe around like a real one. He has earned top marks! Aesthetics: 9/10 Ever heard the pickup line they broke the mold when they made you? Well Ironhide would fit that line to a T. He is nearly perfect, except for a tow tab with nothing to tow, and a screw they made no effort to cover up. Articulation:10/10 I am not a reviewer who likes to give out 10/10s all the time. However Ironhide earned them. Besides the standard can he stand test, he can handle real poses. The kind that would give a collection life. Like him holding the axe in both hands high ready to drive it into Megatron's head! Value: 6/10Ironhide set me back about $15 USD when I was in the US. The comic would cost $4 alone so we're down to $11. What kills Ironhide's value is the fact that he's a repaint, and the 3rd one at that. The other thing is the comic has nothing to do with the future Optimus Prime combiner, despite the fact Ironhide is 5 of 5. The last one and no mention of this Mega bot! Overall: 8.1/10 Not a bad final score Ironhide, and well earned on several fronts. As a collector I would recommend Ironhide since he accepts the torch well from the original. If he's a gift for a child, well the head is a choking hazard sadly. He's addressed flaws I found in earlier Transformers of more recent vintage. What it comes down to is how much do you want a repaint of another figure, who's been done before.